The terms peidao or yaodao are synonyms that were in use simultaneously in Qing official texts to denote the standard waist-worn saber of their military. 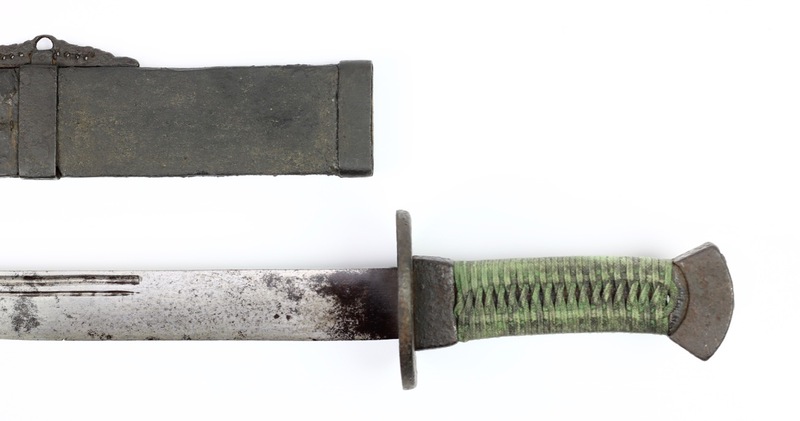 Peidao is the classier term that seems to have come in vogue in the 18th century, referring to a single edged straightsword worn by the legendary Duke of Zhou. The rank and file however usually called it yaodao in both the Ming and Qing dynasties. Yaodao of the first half of the dynasty were mounted in fangshi or "angular style" fittings, with a scabbard and handle to match this geometry. By the mid 18th century a rounded style got introduced in the upper levels of the Qing hierarchy, which over several decades gradually made it to the rank and file to become the prevalent style of the 19th century. Materials: Iron, steel, wood, cotton. Scabbard: Iron, wood, brass, leather, lacquer. 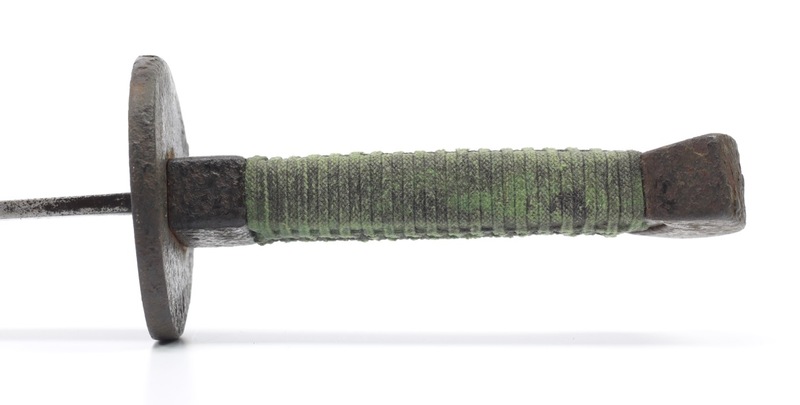 A classic example of an 18th century Chinese military saber mounted in fangshi (angular style). 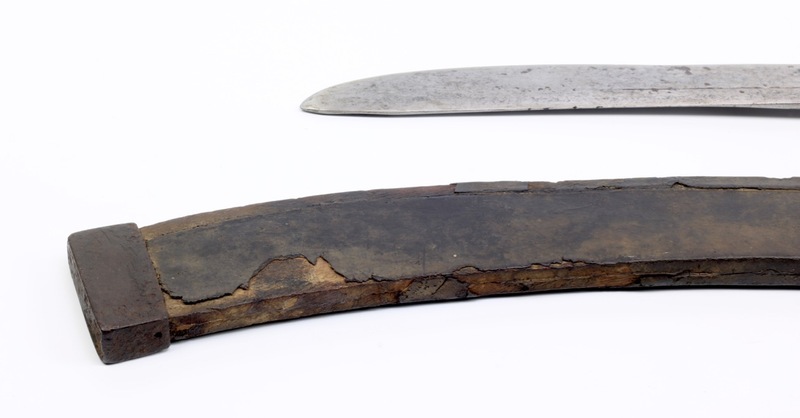 Its slender blade, of liuyedao form, with two grooves, a wider upper groove with a narrow companion. Near the center of percussion the upper groove stops to make way for a subtle backedge. The narrow groove fades a bit further near the tip. The tip has a subtle swelling, as if it's the first stage of development towards the niuweidao or "oxtail saber" that emerged in the second half of the 19th century. 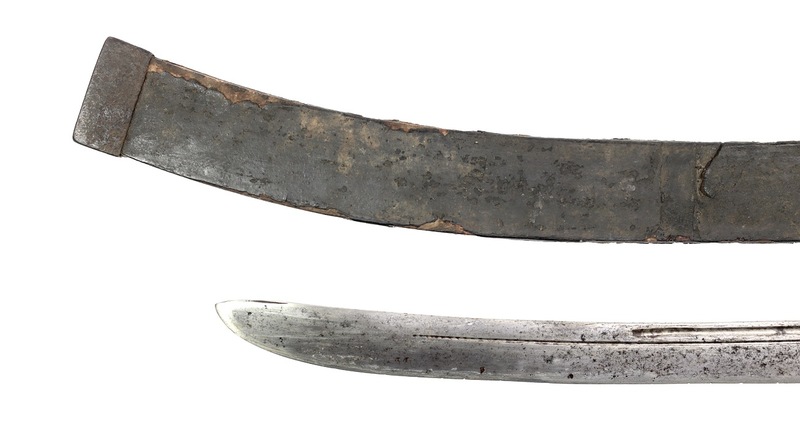 Blade was only lightly cleaned, in its current state there are some subtle hints of its forge folded construction with inserted hardened edge. 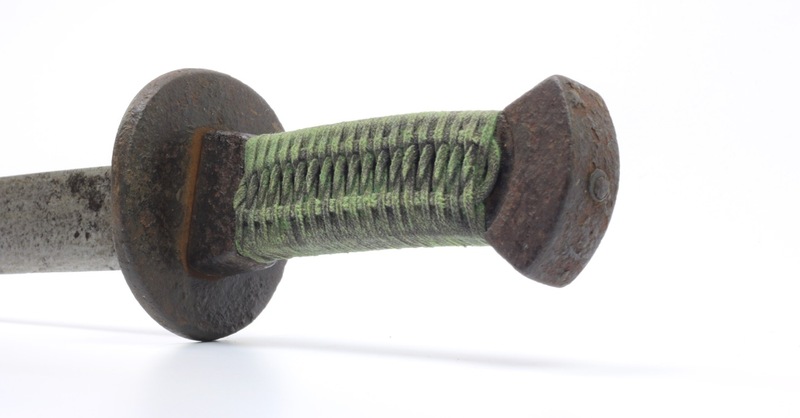 It is mounted in a full set of classic 18th century fangshi fittings, plain unadorned iron save for the tiliang or "suspension bar" which is chiseled and pierced. This decor was somehow deemed important because most sabers have at least some chiseling there, even if the rest is completely unadorned like this one. 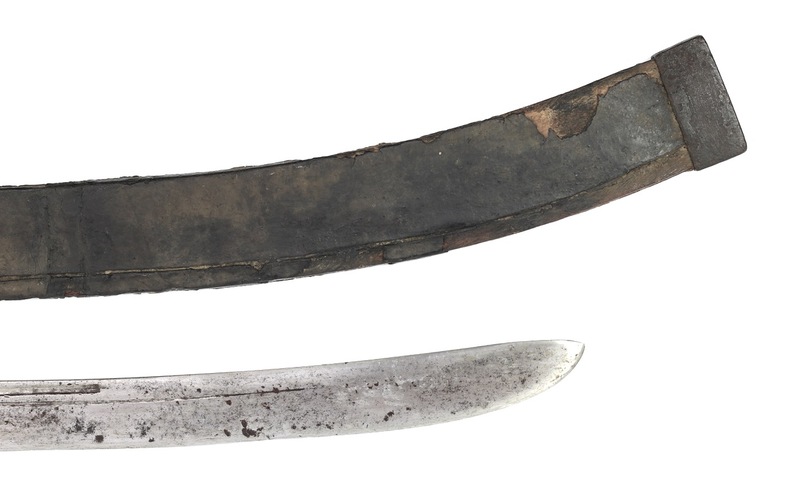 It retains its original hoowen handle, peening of the tang at the pommel remains intact indicating it was never remounted. The current grip wrap is my work, I had to replace a non-historical recent wrap. 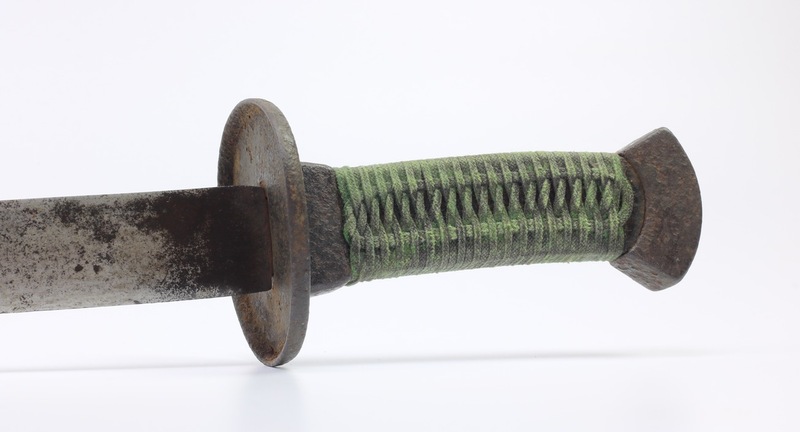 A nice representative example of an 18th century iron mounted saber of the Qing military, retaining most of its original parts. 1. See 工部軍器則例 (gōngbù jūnqì zélì) or "Regulations and precedents on arms manufacture for the Board of Works" of 1811. Chapter 36. 2. See Ulrich Theobald's essay: "Space and Place in Administrative Military Regulations of Qing China". 3. 工部軍器則例 (gōngbù jūnqì zélì) or "Regulations and precedents on arms manufacture for the Board of Works"